The only problem? Unfortunately, the words "pulsatile tinnitus" are not mentioned in the press release nor the numerous press reports about the case. Boo! Frown! Hiss! "Eventually I could hear my heart beating and my eyes moving in their sockets. It was really distracting." "Towards the end it was starting to affect my eyes as well. My vision would pulsate with the rhythm of my heart. Doctors put it down to congestion and gave me any number of sprays, drops, tests and antibiotics - it never made any difference." Sure, the headlines invite jokes and laughs: "I Can Hear My Own Eyeballs," and "Have You Ever Heard Your Eyes Scratching Like 'Sandpaper’?" and "Stephen Mabbutt Could Hear His Eyeballs Move, Heart Beat." One web site even included the story in the "Weird True Freaky" section. As expected, some lame readers and commenters can not resist to make fun of Mr. Mabbutt and his experience. For these people I wish a few seconds of the agony! He could hear his heart beating! Mr. Mabbutt was a whoosher! After six long years of whooshing and other bothersome symptoms, he was diagnosed with Superior Canal Dehiscence Syndrome (SCDS), a condition that we have highlighted here on Whooshers.com. A CT scan revealed the culprit: a tiny hole in the temporal bone in Mr. Mabbutt's skull. The hole caused fluid from the semicircular canals of the inner ear to leak into his brain and conduct bodily sounds. As doctors quoted in the piece mention, the surgery to correct the "heartbeat sound" and the sounds Mr. Mabbutt could hear when his eyes moved was a relatively simple one. The difficulty in his case, like in many other pulsatile tinnitus cases, was proper acknowledgement of the symptoms and a diagnosis of the underlying cause. I'm thrilled for Mr. Mabbutt, but I have to admit that when I finished reading the piece I rolled MY eyes because I was so frustrated that yet another opportunity to expose PULSATILE tinnitus was lost. When I saw this news a couple days ago, I encouraged members of our Facebook group page to send a note to the papers and press agencies to alert them about their inadvertent omission. Now, dear readers, I ask you to do the same! And, how about proper identification of the symptom, doctors?? Pulsatile tinnitus is the perception of a rhythmical noise that is in sync with the patient's heartbeat. I didn't make the name up; your colleagues did! It's important to call it what it is, because doctors who HAVE HAD pulsatile tinnitus patients and DIAGNOSED the underlying causes of such cases have written REPORTS about pulsatile tinnitus that other doctors read and discuss with their colleagues and patients. There are reports about SCD and pulsatile tinnitus. It is a direct consequence that, through these reports, more pulsatile tinnitus patients are properly distinguished, diagnosed and treated. 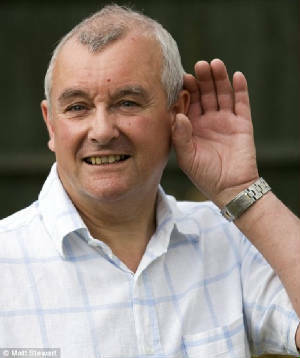 I am delighted to add Mr. Mabbutt's story to our Cured Whooshers page, where you can learn more about SCDS and other possible underlying causes of pulsatile tinnitus. We highlight stories as well as medical reports referenced to above, written BY doctors, FOR doctors. Congratulations to Mr. Mabbutt and to his medical team. But we're not done... pulsatile tinnitus has had and continues to have a *major* PR problem. Let's write these papers and television stations and leave comments under online postings whenever possible, encouraging doctors and EVERYONE to call our symptom what it is: PULSATILE TINNITUS! Doing so helps the entire pulsatile tinnitus community. Who knows? Calling the whooshing "pulsatile tinnitus" from the beginning may have meant a quicker diagnosis for Mr. Mabbutt and many other pulsatile tinnitus patients. For more information about SCDS, please see this past Whooshers.com post and links about SCDS from John Hopkins University, here and here. There is also a SCDS Support page for patients here. Most importantly, enjoy the silence!